Dog training is no different from any other activity — you need the right equipment for the job. Using the appropriate collar and leash allows you to correct the undesired behaviors a dog does on his own during training. Use the following information to help you choose the best leash and collar for your dog. Cotton web: Cotton web leashes are readily available in pet stores and through catalogs and websites, and they come in a variety of colors. A good training leash is a 6-foot cotton web leash — it’s easy on the hands, easily manipulated, and just the right length. It’s also the most economical. For the average-size or larger dog, use a cotton web leash that’s 1/2-inch wide. For toy dogs, use a leash that’s 1/4-inch wide. Nylon: Looking a lot like the cotton web leash, the nylon leash can be easily manipulated. However, nylon isn’t as easy on your hands as cotton web, especially with larger dogs. A training collar: The purpose of a training collar is for you to be able to guide your dog when he’s on-leash and, if necessary, to check your dog. (A check is a crisp snap on the leash, followed by an immediate release of tension.) A check is used mainly for abstention training, which is when you want your dog to stop doing something that he wants to do but you don’t want him to do, such as chasing a squirrel. The check creates an unpleasant experience for the dog, which he can avoid by stopping the unwanted behavior. A buckle collar: When not training, your dog should wear a buckle collar with ID tags attached. The collar can be leather, nylon, or cotton web. Buckle collars come in an assortment of colors and styles and are made of fabric or leather. Collars made of fabric usually have plastic clasps; the leather ones have metal clasps. If your dog weighs more than 50 pounds and hasn’t yet been trained, you’re better off using a leather collar with a metal clasp — a plastic clasp may break when your dog tries to go after a moving object. You must use the two types of collars — training collars and buckle collars — correctly. Remove the training collar when you aren’t training your dog or when you can’t supervise him. And don’t try to use a buckle collar to train. For the untrained dog, buckle collars are virtually useless. The snap-around collar is effective and versatile. The nylon snap-around collar has a metal clasp that enables you to fasten the collar around the dog’s neck. That way, you can fit the collar high on your dog’s neck where you have the most control. This collar also has a stationary dead ring opposite the clasp that can be used when you aren’t training and a loose or floating live ring that should be used when you are training. The following figure shows this collar and its rings. The floating ring is the live ring and the stationary ring is the dead ring on a nylon snap-around training collar. For maximum control, a snap-around collar should fit high on your dog’s neck, just below his ears, and as snug as a turtleneck sweater. To get a good fit, measure the circumference of your dog’s neck directly behind his ears. The following table presents some advantages and disadvantages to a snap-around collar. Take the training collar off your dog when he isn’t being trained and whenever he isn’t under your direct supervision so he doesn’t accidentally get it caught on something and choke himself. Also, don’t attach any tags to the training collar. When you’re not training your dog, use a buckle collar to which you’ve attached his tags. The names pinch collar and prong collar describe the same piece of equipment. “Pinch” refers to the effect it has on the dog, and “prong” refers to its appearance. 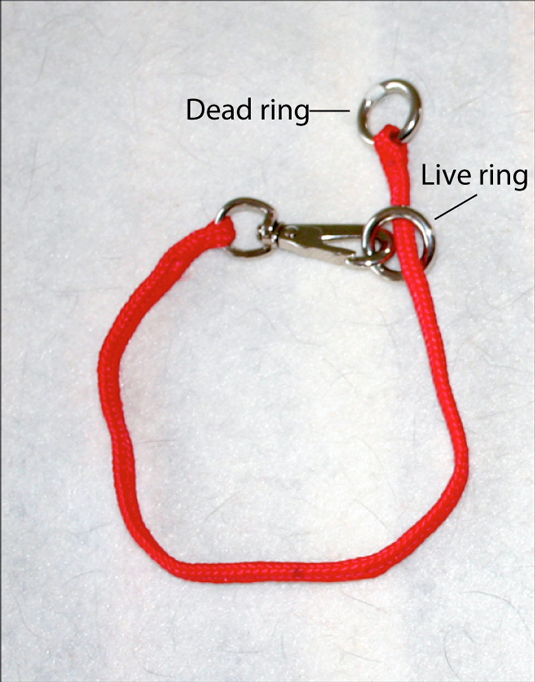 A pinch collar, shown in the following figure, certainly is an effective and efficient training tool. A pinch collar is an effective piece of training equipment. The pinch collar is generally the safest training collar. It’s also an effective training collar for strong, rambunctious dogs. The following table offers some of the highlights and lowlights of using the pinch collar. Pinch collars come in four sizes: large, medium, small, and micro. The large size appears to have been made for elephants. For a large, strong, and rambunctious dog, the medium size is more than adequate. For golden retriever–sized or smaller dogs, the small size is sufficient. For toy dogs, use the micro version. When using a pinch collar, put it on your dog about two hours before training him and leave it on him for about two hours afterwards. If you put it on immediately before training and then take it off immediately after you finish, he’ll quickly become “collar wise,” meaning he’ll only respond to commands when the collar is on. The same applies to any other collar that’s used to train a dog.